In the penultimate battle of the first round, it’s John of Beverley vs. Martin de Porres. The people of Beverley and of Porres have been agitating for this matchup for years — it’s a huge rivalry and hooligans are involved. Yesterday, Phocas the Gardener maintained his focus in burying Isidore the Farmer 60% to 40%. He’ll face Katharina von Bora in the Saintly Sixteen. If you missed yesterday’s episode of the award-winning (in the SEC’s own mind) Monday Madness, watch it here. And then, as punishment for missing it, watch it again. John of Beverley has a posse. John was bishop of Hexham, then of York, England, where he was renowned for his preaching and dedicated to his students. He founded a monastery in Beverley, where he later retired and died in 721. Beverley became an important ecclesiastical center in John’s day and thrived after his death largely because of his cult following. He was canonized in 1037 by Pope Benedict IX. But while John was at one time one of the most celebrated medieval English saints, his popularity since has waned. Little is known about his early life. None of his writings remain. In fact, John probably is remembered best by the influence he had on others. 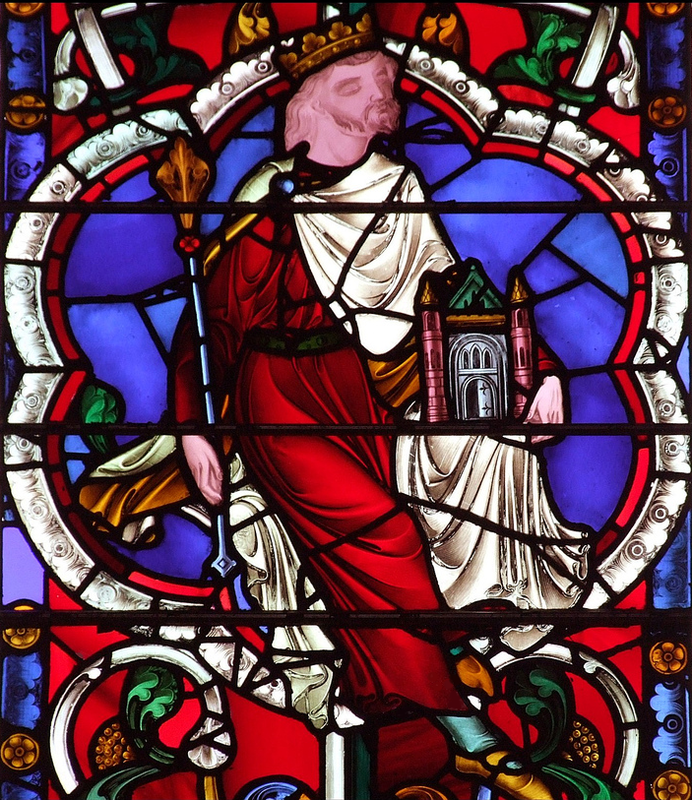 Among his posse are Berthun, the first abbot of Beverley; Saint Wilfrid the Younger, who followed John as bishop of York; and, most notably, Saint Bede the Venerable, who was ordained by John and recorded a number of stories about him in his Ecclesiastical History of England. To the rest of us, his example is a reminder that we may never know the impact we have on others— those in our posses and those who cross our paths, and even those God touches through our legacies long after our earthly lives have ended. God of time and space, you have called each of us to holy tasks and given us companions for our journey: Look with favor upon us, and grant that like your servant John of Beverley, we may be good stewards for our friends and family and living examples of your love and mercy, so that when the account of our lives is given, we may be found to have befriended your Son our Lord Jesus Christ in each face we have greeted. In Christ’s name, we pray. Amen. 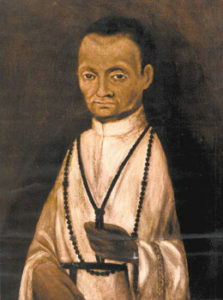 Martin de Porres Velázquez experienced many challenges at the hands of others, but he transformed his hardships into ministry and a lifelong commitment to providing aid to the downtrodden. Martin hailed from Peru, where he was born on December 9, 1579. He and his sister were considered illegitimate children—their mother was a freed slave and their father was a Spanish nobleman who abandoned the family when he saw the children’s dark skin. Martin endured a life of bullying and abuse. Limited by certain social mores, Martin turned to a trade that his status in life would allow, training as a barber and a surgeon. He aspired to join the Dominicans, but at the time, they did not allow brothers with such a background as Martin—his dark skin and illegitimate birth. Undaunted, Martin became a lay helper to the Dominicans at age fifteen, starting as a donado, a volunteer who lived in the community, wore the habit, and carried out menial, unwanted tasks. In time, however, after witnessing Martin’s deep Christian faith and ministry, the Dominicans dropped the rule that “no black person may be received to the holy habit or profession of our Order.” Martin professed his religious vows to the Dominicans in 1603 at the age of twenty-four. Martin was zealous in his work for those who had no hope. He established orphanages and hospitals and ministered tirelessly to the poor and the forgotten. His caring and compassion for the sick were well-known and highly regarded. According to tradition, Martin also exhibited miraculous behavior, from providing instant cures to having the ability to fly. Martin died November 3, 1639. He was beatified in 1837 by Pope Gregory XVI and canonized in 1962 by Pope John XXIII. He is honored on August 23. Martin is the patron saint of hairstylists, innkeepers, lottery winners, mixed-race people, Peru, poor people, public schools, television, Mexico, public health workers, and all who endeavor for racial reconciliation. Merciful God, you sent your Gospel to the people of Peru through Martin de Porres, who brought its comfort even to slaves. Help us to follow his example in bringing fearlessly the comfort of your grace to all downtrodden and outcast people, that your Church may be renewed with songs of salvation and praise; through Jesus Christ, who with you and the Holy Spirit lives and reigns, one God, now and for ever. Amen. 216 Comments to "John of Beverley vs. Martin de Porres"
I voted for Martin because he looked after people with no hope. You are so right Oliver! Martin gets my vote for the same reasons. I think that John will win. Comeback. It’s nice to find another Diocese of Georgia member here at Lent Madness! Yes, and he didn’t give up the first time he was turned away at the monastery. He persisted and became a Dominican — as he’d hoped to. And yet he persisted. Very true! He didn’t let the system get him down. He just kept keeping on. He is one of my faves of the RC church. that is the message I got to. He didn’t give up. He did what he could do and eventually got what he wanted. Good point, Oliver. I voted for Martin, too, for the same reason you did, and also because he worked to eradicate racism. Oliver, you continue to be right on target. I’m with you on this one. I picked st. Martin for his great devotion and overcoming of racial and birth categories in his quest to serve God. Had to go with John, since I serve in Beverly, Mass. Tell Robin, Rob, and Will hello! I go to St. John of Beverley, but am voting for Martin. I was planning on voting for St. Martin even before I read that he was the patron saint of lottery winners. As a person who aspires to win the lottery one day, I now know who will be in my corner. It would truly be miraculous as I don’t usually buy lottery tickets. Good luck with your aspirations Sheila! I trust that St Martin will put in a word for you. Patron of public schools! St. Martin pray for us. I did not mean to imply that St. Martin would insist we vote for him in order to petition his help (for the sake of all of our children.) His victory looks likely but public schools should be a bipartisan concern. It was a no-brainer for me. Martin all the way. My parents taught me about Martin when I was very young, because there was a church named for him in our city and I asked who he was (at that time he was “Blessed Martin de Porres,” having not yet been canonized. Happy to see him here in Lent Madness. That was a long wait between beatification and canonization! I guess fitting given how he had to wait to become a Dominican…lol? I voted for Martin because he did not repay bullying with bullying. No doubts and no questions today. The well-documented life of Martin speaks volumes for today’s followers of this Madness. How appropriate for our own times! I was planning to vote for John “None of his writings remain” – the dread of most scholars – with the hopeful “example is a reminder that we may never know the impact we have on others” but decided to go for Martin, patron saint of hairstylists and mixed-race people (remembering our Rector a former barber, and my mixed-race children, and all who endeavor for racial reconciliation). John healing a man… [able to] grow “hair curling in comely fashion”. Martin, the barber and a surgeon. Martin got my vote. I was tearing up when I got to the end of Neva Rae Fox’s beautiful account of his life and work, work we call all do today in the service of God’s Kingdom (well, maybe not the flying bits). All this despite my affection for anyone who touched the life of the Venomous Bede (1066 and All That)! Yes, me too, though I was surely tempted by the the patron of the Venerable Bede, Martin’s work overcoming discrimination won the day for me. Bede AND Julian! But Martin got my vote—what a guy! Venomous Bede? Oh no! Is that a spellcheck demon, or is there something about dear Bede that I don’t know? Say it ain’t so! Love the trivia, John. Thanks. BTW my great-great-grandfather was John Lewis from Marshfield MA. We must be related. You’d have to be an Anglophile with the name of John Lewis! Count me in on Anglophile. A fan of the great parody 1066 and All That recognizes the Venomous Bede. Obviously Mom had two boys and chose to name them both Bede, figuring at least one of them would be dead before adulthood. The Venomous Bede is the younger brother of the Venerable Bede. He had a beverage named after him (Beady Beer, if memory serves), and was constantly annoying his older brother with his naughty humor. In his lifetime the Venomous Bede was actually more well known than the Venerable Bede because his humor was so popular, and his jokes were translated into several languages. He also was noted for work in domesticating dangerous snakes, hence, of course, his nickname. He was very well known, but the Vatican, never a fan of humor, censored all of his works, and as a result, his story is lost, save in a few very rare publications, of which I had the only surviving copies until they were accidentally eaten by mice while my back was turned. I have forgotten the name–but a 19th C British wit whose brother was a bishop or something, is said to have quipped, “He rose by his gravity, and I sank by my levity.” The Bede Bros obviously were their prototype. This was the most difficult decision. Both were saints I truly admire. Tougher than I thought at first glance. I lived in Beverly, Mass, didn’t know Manny though. One of my kids was born there. I have been blessed and surprised by people, many of them children, who talked about memories and influence I had in their lives. Looked like John had my vote. BUT Martin, was outcast for things over which he had no control, yet he loved and persevered. He struggled for and with the marginalized and for these he won out in the end. Interesting that both have reference to hair . . . and while Martin trained for it, Bede’s account of John’s miracle that included the growth “hair curling in comely fashion” turned my head. So to speak. Lyn, I love your observation of the reference to hair by both saints! I had a brother Martin who died young but wanted to be a priest. It is also very impressive that he broke the color barrier very early in his life. thinking also of my mixed race grandchildren. I was inclined to vote for John because he was an educator whose contributions are known mostly through influences on others. Then I learned that Martin was the patron saint of public schools. Maybe by voting for him, US public education will be granted a miracle. If I could only fly! Martin has quite a story. But with Bede in his corner, it is John of Beverley for me. What? Martin de Porres is the patron saint of mixed-race people? In honor of my African-American-German sons, I will vote for him! I love Martin’s dedication to underserved populations. Also I frequently call my cat (whose name is Martin) Martin de Purres. That was supposed to say Purres! I just had to vote for Martin, because “he persisted!” Facing discrimination by his own father, and then by a monastic order? Boggles the mind, that does! But instead of becoming bitter, he volunteered, and was diligent in his faith and ministry to those even less fortunate than he. No contest here for my vote! I got interrupted and have no idea if I voted once or twice for Martin. Sorry if I did. I have a wonderful terra cotta statue of Martin with his broom, a plate of bread with a cat and mouse about to enjoy a feast, two birds on his head and shoulder and a dog at his feet. Obviously I voted for him; hopefully not twice. It seems to me that the man reported as “healing a man with a scabby head who was able to speak for the first time and grow “hair curling in comely fashion” should be the patron saint of hairstylists. Maybe Martin’s patron saint was John of Beverly? I was touched by the idea of positive influences on others being such a great blessing and miracle, to which we all can aspire. However, I loved Martin because of his perseverance in the face of discrimination, his tireless ministry to the poor, the sick the orphaned and forgotten, and to Peru, which I’ll be visiting in a few months. It was obviously preordained. Children, poor,unwanted? Martin knew he was loved and wanted by God. It’s good the Dominicans awoke to the fact! I voted for John, because even though is is not mentioned here, one of John’s great qualities was his devotion to meditation and contemplation. Beverly, England was founded originally by John as a small chapel to use as a meditation retreat. If you love meditation and contemplative prayer, vote for John! Haskell, your post that “Martin knew he was loved and wanted by God” brought me to tears. It’s something we often hear but today it really touched me. We can persist and rise with that knowledge in our hearts. Being a hairstylist for 30+ years, I have an affinity for both saints but it’s Martin for me. I have several family members who are of mixed race, Persian/Irish, Hispanic/Caucasian and African-American/ Scandinavian. It’s a beautiful melting pot that I love. St. Martin pray for us. For our racial reconciliation, for our public schools and for all to live in the knowledge that we are loved and wanted by God. Just imagine how we can effect the world through that lens. I didn’t know there was a patron saints for lottery winners — maybe that’s why I haven’t won yet! Martin gets my vote. I just can’t bring myself to vote for one who was known to fly. Too bizarre for me, though evidently not for others. It seems normal for those of us who grew up watching “The Flying Nun’! LOL! So why not a Flying Monk? Oh wow, think of the remake possibilities for the patron saint of television–“The Flying Monk,” starring Tony Shaloub as a detective who is able to levitate but is afraid of heights! That would be hilarious, Peg! Cross out the flying and he still wins, don’t you think? This was a no brainer, Martin all the way. Yes Marieclaire, I agree John of Beverly should be the patron saint of hairstylists. I’m going to honor the teacher and obvious long shot with a vote for John. And if he would like to intercede in the “hair curling in comely fashion” department, I’m ok with that. He took care of the poor and he could fly! What’s not to love? Golden Halo bound! I voted for Martin. Our churches December Birthday Party Group now has a new Saint! As a public school teacher, I had to vote for Martin! I’ve loved Martin ever since I read he is credited with establishing a hospital, an orphanage, and a clinic for dogs & cats – a friend to all creatures (according to “Saints Preserve Us”). As we are visiting Mexico at this time, Martin is my choice. His story is compelling on many levels. Odd that Saint John cured a man w/a scabby head but St. Martin is the patron saint of hair stylists. Martin de Porres! His patience extended into his heavenly life, since he had to wait so long to be beatified, and then again to be canonized. I admire his quiet persistence. Saint Martin of Porres, not to be confused with Porra, all the way. He was, I think, the first mestizo ever to be proclaimed saint in the Roman Catholic Church of South America. And it took that long! Patience indeed. Plus, unfortunately, John’s bio doesn’t really give me much to go on. Mestizo would be technically white and indian, whereas Martin is referred to as black, son of a slave mother. That would make him technically mulatto instead. Though perhaps the racial categorizations differ in South America. North and South America handled racial blending differently in ideological terms. Would that el norte had been more tolerant. We might have found ourselves better prepared to handle 21st century challenges without being hobbled by rancid racisms. In honor of my biracial daughters and granddaughters, I voted for Martin. Though I would like my hair to curl in a comely fashion, rather than the uncomely fashion it seems to insist on. Wow, I knew almost nothing about Martin de Porres before today. Now I say Martin for the Golden Halo! “Martin is the patron saint of hairstylists…” Done; I’m in. With his ability to fly, Martin has to.be the patron of those engaged in or with an interest in astrophysics! He gets my vote. Martin because his passion for Christ broke down racial and social barriers. Anyone entrusted with a patronage portfolio as varied and crowded as Martin’s gets my vote! I wish John had been matched with a more “ordinary” sort of person. After reading his bio, I was all for him. But Martin’s zeal “for those who had no hope” tipped the scales. May he be an encouragement to those nowadays who do the same. So that explains it! “Martin’s zeal ‘for those who had no hope’.” I’m a very big fan of Martin de Porres, but when it finally came around to voting and I saw that the trend was so lopsided, with his opponent still only 800 some votes, Martin whispered in my ear, “vote for John Beverly.” And I did. I think I have finally found the Saint I want to go all the way! GO MARTIN DE PORRES!!! I was going to vote for Martin, for integrating the Domincans, but as a recovering cancer patient whose hair is just beginning to grow in, I voted for John of Beverly, praying that he will grant me hair that curls in a comely fashion! That is so interesting Melanie, I actually voted for Martin but for a similar reason. First I voted for him because my kids are mixed race, but also because I chose to start taking Tamoxifin, which I have to take for ten years to keep Cancer from coming back, on Martin’s feast day, August 23rd. So, I felt I had to go with him. Good luck with your hair! I believe it will come back beautifully! Although, I have to say I did almost go for John too because my daughter suffers from Trichotillomania (where you pull out your hair) and I want her hair to grow back in lovely curls too. I hope John of Beverly will forgive me for not voting for him. Blessings of hair, and all other things healthy, to both of you. I voted for Martin because he seemed to be an”underdog” and his help for the downtrodden. It dates to at least 1492 in the Americas. Our modern ideology of racism and white supremacy gets into full swing in the 17th century in tandem with the slave trade. But the root of the North Atlantic slave trade dates to 1492 and a certain Spanish-funded Italian exploiter. I think there are many roots. Greed for gold, greed for spices, greed for furs, greed for land all play a role. Columbus was one person; if not him, someone else. And 1492 was one year; if not then, somewhen else. Our conceptual world is still recovering from the shock of discovery. I voted for John because I liked the collect written about him, and I pray that my life may have an influence on all those around me. A pity vote for John today. Also hoped to hear more about those “serious sins”. Enquiring minds, etc. But I think Martin has this one in the bag. All those good saint hallmarks…AND he can FLY? Whoa. Sorry John. We barely knew ye. I was surprised that I had a hard time with this decision. Love that both were tonsorial in their gifts. Being a teacher and realizing that God is calling me to use that gift with the youth of our church, I could put myself in John’s position a bit. But, I love what Martin did and how he persevered to overcome prejudice. Having been a public school teacher for 30 years, Martin got my vote. Both worked to bring God’s kingdom on earth. This pairing made me think. Not knowing the impact you have on others (my hope) almost got my vote, but I was swayed by Martin’s story. And I’d sure like to know how he got to be the patron saint of televison! I’m confused. Initially it sounds like John is a great man and teacher who has many great followers. Later Julian of Norwich infers that he is a “very serious sinner” made a Saint and there is no explanation further. It may be Martin for me. Yes, I too would like to know what Julian of Norwich meant by that. Like Paul, the greatest of sinners. See my comment at 12:32 pm on hearsay evidence and the sin of gossip. Paul, the greatest of sinners, and Moses, the most humble man alive. Hyperbole seems to be a warranted Biblical style. But yours is certainly the most pointed warning against gossip, although those Corinthians . . .
Oh, hyperbole is very much in style these days, is it not? Today is the battle of the hairdressers. I feel that I ought to vote for the mestizo, or probably more accurately mulatto. I recognize the themes of bullying and discrimination and of overcoming them at least as far as finding an avenue of faithful service. And yet I am charmed by John of Beverly and his miraculous talent of getting people’s hair to “curl in comely fashion.” Today I find that I am responding to the “cloud of faithful witnesses” who speak on John’s behalf. Bede the Venerable and Julian of Norwich are good enough for me. A nearly forgotten saint from the middle ages, dedicated to his students, whose seat throve due to his preaching, and whose writings, like those of the Greek poets’, have been lost, appeals to me today. May we all be remembered after we are gone for the good we did while alive. I’m voting for the bishop who helped keep learning alive in the middle ages. I was Vicar of Beverley Minster in Yorkshire, England, and was privileged to have responsibility for John’s mortal remains. The bio doesn’t say that he is patron of the deaf, having had healing miracles which Bede records. Various schools for the deaf are named after him. I grew up in No. Beverly, Mass, and there’s a well known American school for the deaf in Beverly. Just googled to make sure it was still there… it is, and was founded in 1876. John must be pleased! Patron Saint of television, all the way. Ditto from me about the “sinner” mention from Julian of Norwich. What’s with that? It was thrown in there without any explanation. I re-read the bio in case there was something between the lines that I had missed but nada. For that reason … and because I am partial to Peru … my vote goes to Martin. I predict Martin will win by a hair. And talk about inclusive….how in the world did he get assigned to such a diverse group of professions…hair stylists, lottery winners, public school teachers, etc., etc., and so forth ? Perhaps that is a miracle unto itself! John had me with the poor soul and his scabby head. In our times this voice for racial reconciliation is a natural. John ordained, among others, Bede the Venerable without who we would have no recording of any of the poetry of one of the earliest, if not first, Anglo-Saxon poets to write in the vernacular, Saint Caedmon (who has an amazing story himself). But, Martin integrated the Dominicans. (It is sinful and shameful that such an unChristian rule ever existed in any religious order of the Church.). I love that he is the patron of all those who endeavour for racial reconciliation (interesting that the Rev. Dr. King’s first name was Martin), though the patron of Mexico bit confuses me. I had long thought that the rather popular Our Lady of Guadalupe served as the patron of Mexico. I shall vote for Martin the Intergrater now and pray for the opportunity to vote for Caedmon the Poet next year. Bede has always been a favorite along with Julian. Martin, for so many reasons that resonate today, plus his being the Blessed Forerunner (fore-flyer?) of the Flying Nun! I do, however, wish we knew more about John of Beverley, though my sense from the bio is that he would be perfectly content being under the radar, a quiet saint among the heavenly choir. What’s good enough for Julian of Norwich is good enough for me! John of Beverly for me, I long for “hair curling in comely fashion.” And while Martin, as the patron saint of hairstylists, could most certainly style my hair, I need John’s good will to get it! If John of Beverley was good enough to be called an “exalted saint” by Julian of Norwich, he’s good enough for me. Martin also served the Lord in many inspirational ways, but he sure doesn’t look happy about it; he looks downright grumpy. I believe the road to the Golden Halo is paved with the verses of Psalm 100 and I suspect that John’s alleged ability to fly was inspired by gladness and joy. John’s collect alone – influenced my vote. He planted seeds of love and encouragement throughout his life that continue to yield. Besides – as a United Methodist who occasionally joins with my Episcopal friends for Wednesday evening Eucharist at St. Bede’s in Mar Vista / West Los Angeles…How could I not vote for him? I remember reading abiut Martin as a child and was struck by his tenacity. Glad he is a candidate. Martin for the Golden Halo. John gets my vote-not only is Bede his champion, but the concept of any of us not knowing the impact of our faith and actions on others long after we are gone is what I aspire to. I voted for Martin because more than ever we need racial reconciliation in our broken world. Just didn’t have enough information about John of Beverly—although showing up in Julians’s Writings does have some street cred, sounds like they were from the same hood! I only voted for John of Beverley because I knew he would be the underdog. Well, and because he had a posse. I must confess, the posse very nearly swayed me! I served at St. John’s Beverly Farms, MA… so it was an easy vote for me…..
To work for the poor and forgotten is to do God’s work. He was a Saint in a world where God’s work was dimmed by hate. I am voting today for John, who I expect to lose badly. As bishop of the beautiful Hexham Abbey, devoted to prayer and meditation, with gifts of healing and preaching, and and mentor to Bede, there is much to admire. To have such influence in his day, but to be largely forgotten now, is the fate of many scholars. Also Julian of Norwich is my local saint, so I can hardly vote against her. Talk about multi-tasking, Martin’s sponsorship as patron saint of so many groups means he continues to touch so many lives and occupations. Not without regret, however. John nowadays is by any measure the less illustrious; but the town he founded is charming and in 2007 was named “the best place to live in the United Kingdom.” Its beautiful parish church, Beverley Minster, survived the dissolution of the abbeys and, like John is something of an unsung gem. I owe my knowledge of it to my late wife, who went to university in nearby Hull. As to whether John was a “serious sinner,” let us not be swayed by hearsay evidence, even from such a source as our dear Lady Julian. Gossip, reverend Lady, is also said to be a sin, be all well though it may. I meant to be quoting you, Davis, not correcting you! Sorry! That’s actually what I wrote at first and then changed, so as to enhance the aura of obscurity. It was the most obscure comment EVER. I agree, Oliver. Even though I have been to Hexham! Martin de Porres, a saint in his time and a saint for our times. I’m going all the way out on my bracket limb here and throwing my support early to Martin for the Golden Halo! I’m old enough to remember when Martin was canonized. I first learned about him at that time and have admired him ever since. I hadn’t remembered, though, that he so impressed the Dominicans that he single-handedly inspired them to change their exclusionary rule! WOW. But c’mon, SEC, this matchup is totally stacked! Martin’s story is amazing, and I’m happy to see a Saint from Peru on the bracket. Yet…. The turn of the 8th century in England was certainly not for the faint of heart! We’re talking before Lindisfarne, before Alfred the Great, before the Vikings and even rudimentary indoor loos!, when wolves were still a threat, and “England” was a collection of warring mini-kingdoms. That he was able to nourish Christianity in such a time as that, those Dark Ages; that Bede was his protegé and Julian still thought of him fondly as her neighbor some six centuries later; that after a thousand years he is still remembered and revered speaks emphatically to me. I’ll throw my hat into the ring with the 16% for John of “beaver-stream”. YES! (Missed this while ago) Inderawhata??? Word Nerd, unable to resist an enticing deer I ate (stet — Spellcheck, I am in awe of thee), has pursued this. I actually guessed half of it — it means “in the wood of Deira,” Deira being the region. Of his order to persons of color. Well, Davis, aren’t you the poet! In high school I was the Science Department Poet Laureate. Scientist and climate denier argue in a saloon. May reason help us keep the earth green and blue. open to all Christian ladies and germs. and Lenten discipline evolved into sick burns. I voted for Martin and was surprised to learn that he was canonized at such a (relatively) recent date. How could I not vote for St Martin? I really love learning about all of these remarkable Saints and sometimes have a difficult time choosing one over the other, but really had an easy time today. Martin de Porres for me. It’s inspiring how he so patiently worked his way into the Dominicans, overcoming prejudice by his example of loving service. John of Beverley for me. I am always inspired by the thought that what we think may be mundane encounters with others may be flickers of light along their paths of faith. Martin de Porres, no contest on this one. I’ve known and respected him since I was just a very young child. We revered him as one of the patrons of students and children living in orphanages, of which, I was one. Will someone please explain why/how Martin de Porres became the patron saint of television??? Anyone??? Anyone??? Bueller, Bueller??? most likely the same reasons that Isidore of Seville is the patron saint of the Internet. I voted for Martin…he was a champion for the marginalized of society. Did he need wings to fly and, if so, where are they in the picture! Way too sketchy for me and too little but oral tradition. I don’t care whether Martin de Porres could fly or not, but he was a holy man who ministered to the poor and outcast. In a time when my country desperately needs to achieve racial reconciliation, it’s Martin for me! Today I voted for John of Beverly because his ministry speaks very personally to mine. Martin DePorres is more politically correct, for lack of a better term, but John of Beverly left a legacy that is more far-reaching then we can know. The fact that Martin de Porres was canonized by our most beloved Pope John (even to those of us who are most solidly Protestant) is icing on the cake of his very important life. For his faithfulness to his calling, even though the order to which he was called did not recognize that calling for many years; for his devotion to helping orphans, the sick, and many others with special needs; and for the importance of recognizing the beauty and multitude of graces God has given people of many varying mixtures of heritage and customs, I vote for Martin of Porres. Could someone please translate. “ROTFLMAO”? Never heard of that word. You can easily google all these acronyms. This one is: Rolling on the Floor Laughing my A– Off. Thank you St. Celia. I didn’t want to ask. Thanks for keeping me on the straight and narrow. Fly, Martin, fly. You got my vote. Martin is clearly the more “saintly”, living a life worthy of a halo, but John of Beverly’s collect really touched me. I could never be as noble and king and generous as Martin, perhaps I could live my life in a way worthy of John. My home parish is St. Bede in Forest Grove, OR., which lent thought to the possibility of voting for John, since it was he who ordained Bede. Alas, I must go with Martin, for the example of his life and work, and the fact his Saint’s Day is my birthday! I voted for Martin. My church is St Martin’s and I support all that he represents as a Saint. I really wanted to vote for John. What a wonderful lesson for all of us – we touch the lives around us. I hope the lives I touch see God’s love. In the end I voted for Martin because of all he did. Have to go with the man with perseverance to serve God when others did not want him and for the one who serves the poor , orphans and the sick. Full of humility. As a Public Health Nurse for 20 years working with many poor and both documented and undocumented in southern New Mexico – Martin is my man. A man of compassion and persistence in the face of repeated rejections. Anybody who can fly (my little Nancy can fly very well) deserves a vote. Ah, but they both fly. Boy you SEC guys know how to make it hard. Still, had to go with DePorres. There’s something about tenacity against all odds, and doing something that needs to be done, and nobody seems to be doing it. That nobleman who abandoned the family when he saw how dark the children’s skin was must not been paying much attention if he fathered (at a minimum) two children before he figured it out. I feel this election has been tampered with. Clearly the blah description of John as someone whose life we know nothing about will keep people from voting for him. And I see it has! I think the biaised PR given to Martin over John is a form of election rigging and highly reprehensible. In fact, there ought to be an investigation. By his example Martin persuaded the Dominicans to change their views. He gets my vote. I decided to learn more about John of Beverly. That’s how I learned about his banner. The banner was carried into battle by a ragtag English army fighting against the invading King David of Scotland, and the English won. So revered was the banner that when troops were levied in Yorkshire, the town of Beverly only had to supply a single man carrying John’s banner. Five English kings carried the banner into battle, most notably Henry V. Henry V attributed his victory at Agincourt to John of Beverly. Emily certainly had the tougher job, campaigning for the saint about whose life so little is known, but I have to object to the use of “posse” not once, but twice! Just because “All the kids are saying it,” doesn’t mean the word belongs in a piece with more scholarly vocabulary and syntax, and frankly, references to “posses” are getting rather twee. Believe me, I have a 17-year-old. Being a Yorkshire lass born and bred I had to vote for John of Beverly – and while we may have none of his writings and scant information about him, I was impressed by the impact he had on others. The Collect said it all – we are called to be “living examples” and clearly John of Beverly was such.